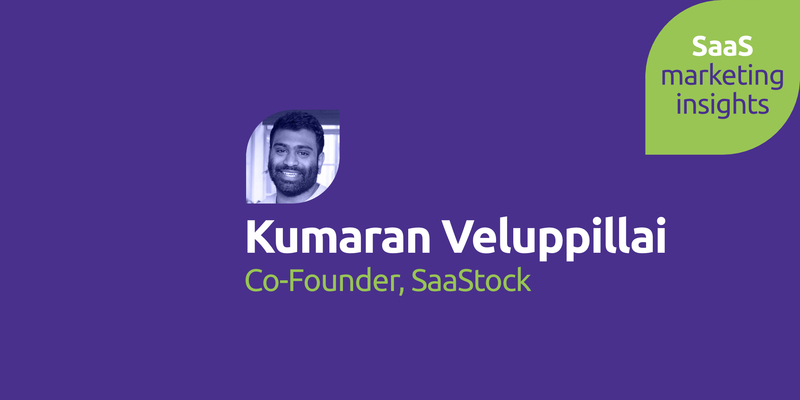 Three years ago Kumaran Veluppillai attended the very first SaaStock event in Dublin as a SaaS marketer looking for an opportunity. Little did he know that he would end up co-founding the event and working with his team to quadruple its attendees. 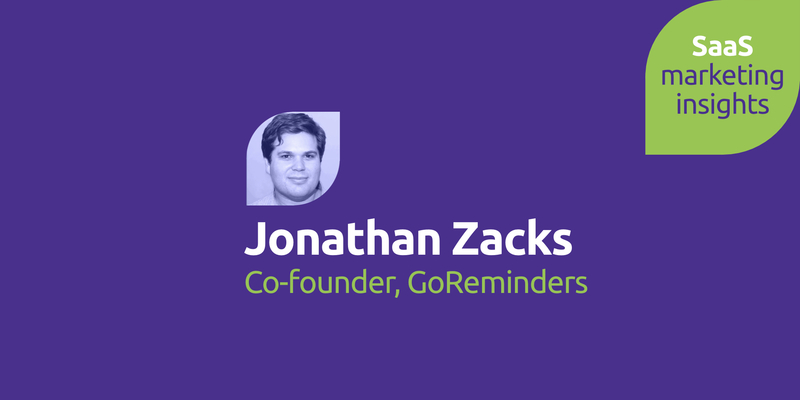 What has he learned about marketing and the European SaaS scene along the way? Paul: On today’s show I have an interview with Kumy Veluppillai, Co-founder at SaaStock, hope you enjoy it. the show so far Kumy? Kumy: Yeah it’s been great, this is my second year here, really enjoying it. It’s always great when you get a bunch of SaaS founders and execs in the same room, so many great learnings, so many great conversations so it’s been a lot of fun. 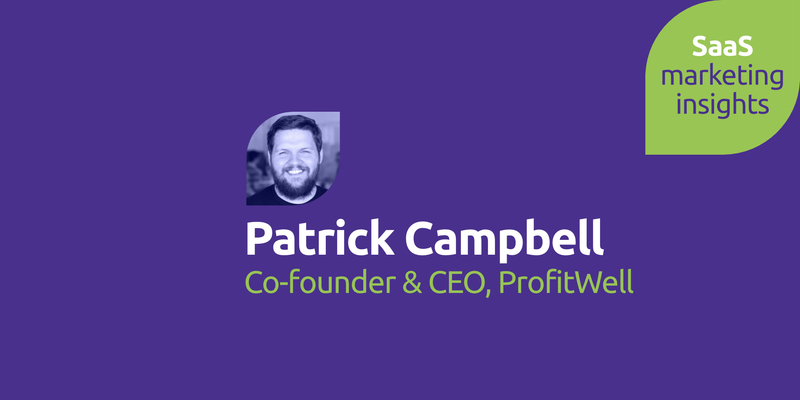 Paul: So you’re one of the Co-founders of SaaStock, who’s your other founder? Kumy: Yes it’s Alex, Alex sort of started this all on his own. So the story goes that he was looking at various entrepreneurial endeavors and he’s told me some of his other ideas and they weren’t all that solid. In some ways it was somewhat accidental so he just started by doing a podcast and started interviewing a bunch of founders within the European SaaS ecosystem and then at that point people were like hey maybe you should do this in person and so he organized a couple of meet ups and I actually spoke at the second meet up organized in London. At that point he told me ‘hey, so I’m thinking of doing this conference in Dublin bringing together 700 SaaS founders, execs and investors’ being the nice guy I am, I was like ‘yeah, you should 100% do it’ but I walked away just feeling it was a pretty crazy idea. Thinking that it would be almost impossible to do and so later that year, I was actually an attendee in year one and I arrived in Dublin to see 700 people there, great content on the stage and for the first time I’d met my peers and had the sort of conversations which I’d really been lusting for in. I just didn’t have that support system of other folks who were going through the same pains and challenges I was. hopefully better than I can’ and so that’s sort of when I came on board. That was about a year ago now and then we concluded our second conference in September of last year and managed to double the size of the event and also assemble the format from the one day event to a three day format and now it’s sort of building up for year 3. Paul: Wow, so it begs the question what were you doing before you did SaaStock? You were a SaaS marketer weren’t you? Kumy: Yeah I was and so how that came about was entirely random. Paul: The best things in life always are. Kumy: So I’ve been working with a local VC firm, it sort of operated a studio model and we were throwing a lot of stuff at the wall and testing a bunch of ideas. Paul: Some of it stuck? Kumy: Yeah and unfortunately for me the ideas I was throwing at the wall didn’t quite stick and I was looking for something new to do but I wasn’t sure what that was. I was taking some time out and there was a service which I had sort of registered for, it was called ‘hire my friend’ I put a very small bio on it but got a connection request from a SaaS founder in London, I didn’t really know very much about SaaS so just ahead of meeting him I remember reading David Scott’s blog, reading a bunch of the terminology and thinking ‘ok’. Paul: knowing the lingo is half the battle, especially in SaaS. Kumy: Yeah so I thought ‘this seems kind of interesting’ and met up in a coffee shop and offered me a role to join the business as the first marketing hire. Paul: So which business is this? Kumy: The company is called Kayako, it’s a customer service platform, bootstraped company that started in India and they were setting up offices in India. They had managed to grow the business organically through word of mouth and no real considered marketing effort. Paul: So like zero cost of customer acquisition? Kumy: yeah but it’s never always entirely free, but through no concerted effort other than actually building a sort of a mini brand within the segment they served. So that’s sort of how I began to get to grips with SaaS and I started through my background in direct response marketing using SEO and AdWords. Then as we started to launch the new product I learned a huge amount about branding and repositioning and started to look at new customer segments for our software. there are some things that you tried in terms of marketing that didn’t work and some things that probably worked beyond your expectations, any insights into what bombed for you or what went particularly well? Kumy: So I think actually the biggest lever we pulled was actually around pricing and packaging so historically as a business it was a download perpetual product. 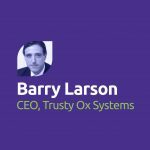 Kumy: Yeah it’s the way software used to be sold and someone would buy a license, pay a one off fee and then we would say goodbye and wish them all the best with our software and as we were sort of making that transition to a cloud subscription company. How we positioned ourselves, how we messaged the value we delivered and also how we priced the product had change significantly. It was those tweeks around pricing which really moved the revenue lever the most. So often in the world of marketing we look at some of those quick hacks to generate more leads or to generate more pipeline and we tried many of those things and some completely flopped and certain things worked. However, consistently the lever we were able to pull the most was pricing and I think it’s often the case for a lot of SaaS companies. Where we don’t truly understand the value we are building and delivering to customers. Paul: leaving money on the table. Kumy: Yeah leaving money on the table and through understanding that better and being able to maximize your value, significantly impacts on the business. Paul: That’s great, I think that’s a really good insight because as marketers we tend to start thinking about SEO or paid or some other channel but if the fundamentals aren’t right you’re missing out. So I think that’s pretty smart to look at that side of it and obviously it went really well. So going back to SaaStock, this is going to be year three in September, you’ve also got news about taking it on the road? Kumy: Yeah, so year three we’re looking to continue the global event in Dublin, we’re looking to double the size again to about 3,000 attendees. who live in the same cities, working on SaaS have no idea that there was someone else who was facing the same problems or going through that same journey. So those local meet ups proved to be very popular and proved a really great way to bring people together and so this year we are extending the format. Paul: So it’s a European tour. Kumy: So yeh, we’re extending the format not just in terms of taking it from what was effectively an evening meeting to a full one day event, crammed with practical content for founders and executives to take away and apply to their businesses. 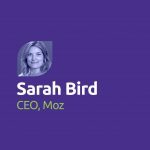 Also as expanding the geography, so at SaaStock last year we saw many folks travel far and wide to attend SaaStock and we kind of feel that the same wave we rode when we started SaaStock in terms of bringing the european community together very much applies to many markets outside of the US. With SaaS you can start from anywhere, it’s a very exciting opportunity to bring it to different areas across the world and so we’ve announced twelve cities including Sydney, Helsinki is one which is proving very popular, Cape Town, New York and so expanding to other markets outside of Europe. Paul: That’s fantastic, to take something that you started in Dublin and now you’re expanding and building a global brand, SaaStr needs to look out. Kumy: Yes so we are really excited by what we’re doing and we also love what SaaStr does and that’s why I’m here. We have our own take on how we like to do things, we hope that flavor resonates with the new communities we start working with. Paul: Cool, so final question, I wanted to ask you about the differences you see in the European SaaS community market versus over here San Francisco, West Coast, The Valley, all of that. The thing that I keep hearing is Capital, access to capital is very different, is there anything else that you see because you’re coming from a completely different perspective? last couple years there’s a lot of very cool companies. We’re sort of going through that fast wave and I think what’s unique is how the broad spectrum of these verticals which are these SaaS applications are building solutions to solve a real meaningful business problems. I think the second is, so as you sort of touched upon, capital is a constraint but also with that comes a different market and so the market is significantly larger here in North America and a really hot topic for European founders is when is the right time to make that move to the US, how do we get those first boots on the ground, who should we be hiring in what roles, how do you manage the culture of the business and so I think that trend continues to be the case. Paul: So you see that as a topic that people always interested in at SaaStock or just out in the halls talking about? Kumy: Yeah it’s very much a popular topic, both on stage but also a conversation amongst founders but I do feel that more and more companies are starting to feel that they can still build big companies remaining in Europe then having a second office versus having to move to the US. Paul: Move the whole, lock stock and two shooting barrels. Kumy, that’s fantastic thank you very much for your insights, good luck with SaaStock this year I hope to make it across, it’s a great excuse to go to Dublin.